Generic Company Place Holder Christmas Trivia - Are You Smarter Than Santa? It’s the most wonderful time of the year, they say. Sure, the country is in a recession and holiday sales are looking more Scrooge-like with each passing day. But the App Store is offering a fair amount of cheer for those needing a little Christmas right this minute at prices befitting a more austere Yuletide. Here is a round up of some of the better holiday applications for the iPhone and iPod touch, with only a couple of lumps of coal thrown in. 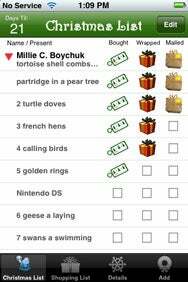 You Better You Bet: Better Christmas List boasts a user-friendly interface that lets you break down gift-giving by group. One thing the iPhone and iPhone touch do well is manage lists. There are probably 26 varieties of note or list-management apps. And the App Store being what it is, there are naturally at least half-a-dozen Christmas-themed shopping apps, all boasting appropriately festive user interfaces and with similar sounding names designed as much to beguile you as inspire Yuletide cheer. I tried seven of them. Of that lot, three stood out: Pocket Santa, Christmas List, and Better Christmas List. Better Day Wireless’s Christmas List and Andrew Grant’s Better Christmas List are natural rivals. “Better” is clearly a taunt, but the adjective is at least arguable. Better Christmas List’s user-friendly interface lets you set and manage a gift-giving budget, which you can then break down by group—family, friends, work, clients, and so on. Better Christmas List also tracks how many gifts you have on your list, how many you’ve bought and how many you have left to wrap and mail. A banner at the top of the screen helpfully informs you how many shopping days are left until Christmas. Grant, by the way, also sells a Hanukkah Holiday List app that is identical to Better Christmas List in function, and differs only in theme: a light blue theme replaces the red Santa and holly theme. I’ve Got A Little List: With Christmas List, you can track what you’ve bought, wrapped, and mailed. Christmas List isn’t any less worthy than Better Christmas List, and in fact has a few features going for it that might make the competition a little envious. Christmas List has the best list display by far. The app keeps track of how much you’ve budgeted and spent, as well as clever graphic notations of what you’ve bought, wrapped and mailed. Adding gifts is easy, and adding recipients is easier still: You can add names from your device’s contact list with just a couple of taps. 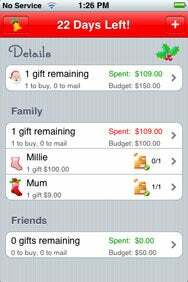 I also liked App Shop’s Pocket Santa, primarily for its budgeting feature. You set a Christmas shopping budget and the app tracks and prominently displays what you’ve spent so far and what you have left. The interface is perhaps less festive than its competitors, but the simple crimson and white color scheme fits these austere times. You can add gifts easily, and the app lets you apply multiple recipients to the same gift with a tap. Pocket Santa also lets you view your complete Christmas list or lists broken down by recipient and what you have yet to buy. Pocket Santa does have a few drawbacks, however. The global Christmas List view does not show you what you’ve already bought. Also, it would be nice to track what you’ve wrapped and mailed, not just what you’re shopping for and what you’ve bought. Finally, adding gifts is easy, but adding recipients is more of a chore. After using Christmas List for a while, perhaps I got too accustomed to the ease of adding gift recipients from my phone’s contact list. Certainly that’s a feature that Pocket Santa and Better Christmas List should include in a future release. A Little Holiday Music: The Internet radio app Christmas Music features 17 playlists of beloved holidays songs. And also stuff by William Hung. It’s Christmas Eve. It’s bitterly cold and the forecast is snow—lots of it. You’re marooned at Washington-Dulles Airport and your flight to San Francisco has just been delayed for the fourth time. Although the guy from the airline won’t say it, there is an excellent chance your flight will be cancelled. What do you do? Why not accept your fate, repair to the bar and—here’s the salient point—cheer up with some pleasant and uplifting Christmas tunes? The App Store is selling about half-a-dozen Christmas sound-and-music apps. nuTsie’s Christmas Music is an Internet radio app. Use the scroll-wheel to select among 17 playlists covering styles from traditional and classical to rock and hip-hop. There’s even a list devoted to nothing but Jingle Bells. (Hmmm. On second thought, listening to 126 different versions of Jingle Bells in an airport lounge doesn’t sound very uplifting at all.) You can buy any song from the iTunes Store with a couple of taps. XME’s Christmas might best be described as a holiday version of ambient noise apps such as aSleep or Ambiance. The app has a straightforward scrolling interface and features an eclectic mix of ambient noise, electronica and traditional carols. I found the white noise with piano playing “O Come All Ye Faithful” strangely soothing, marred only by a pause before the track restarts. KVapp’s Christmas Sounds Premium is a clever gimmick marred by a flawed execution. The app features 16 Christmas sounds, including jingle bells, Santa’s sleigh and more ethereal sounds. You can play the sounds for friends while you are on the phone. You place your phone on speaker, hit the home button and launch the app to share the good cheer. Trouble is, that’s about all you can do. All of the sounds are short—no more than 20 seconds or so—and none of them loop. So you need to keep pushing the buttons, mixing and matching, until you get bored after about two minutes. This app needs more sounds, as well as a record and playback function. 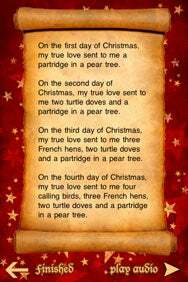 In addition to holiday songs, A Classic Christmas also offers five Christmas tales, including The Twelve Days of Christmas. Apart from nuTsie, my favorite sound-and-music app by far this year is Zachary Carter’s charming A Classic Christmas. The app features Christmas stories, classic holiday songs with piano recordings by royalty-free music guru Kevin Macleod, and a clever alarm clock featuring a choice of sounds such as Santa and his occasionally mischievous elves. Be advised: The alarm and the app stop working when your device goes into sleep mode. Apparently this is a conflict with version 2.2 of the iPod touch and iPhone software update. The developer is reportedly working on a fix. When you launch the app, Tchaikovsky’s “Dance of the Sugar Plum Fairy” on infinite loop greets you immediately. I could just listen to that for an hour. But I was also entranced listening to the five stories, which include ‘Twas the Night Before Christmas, Santa’s New Idea, and The Foolish Fir Tree. You can also read the stories without the audio on. I was disappointed, however, that there is apparently no way adjust the type size on what is small text even for my youngish eyes. The only real drawback to A Classic Christmas is it’s one and only design gimmick. You need to drag an icon to the middle of the Christmas tree to read the stories, set the alarm or listen to the music. The jerky execution is not much offset by the accompanying chimes and page-turning animation. I’d rather just tap a button, thanks. Christmas Cascade: Line up three holiday-themed blocks to rack up points in Menzel's Christmas Game. Christmas requires games, and some of the better holiday-themed games will absorb kids from one to 92. Well, maybe not infants… but my six-year-old got as much of a kick out of Rudolph’s Revenge and Menzel’s Christmas Game as I did. 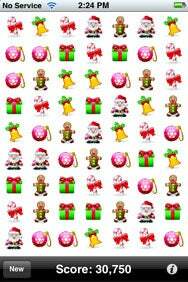 Joe Crump’s Menzel’s Christmas Game is a Santa-fied version of the old cascade tile games that are commonplace on the Internet. The rules are simple: Simply touch the screen to move the holiday-themed blocks—Santa, candy canes, gingerbread men, and so forth. Connect three or more and watch the points add up. And the game has three difficulty levels: easy, normal, and diabolically difficult. I just wish the game had the option of turning off the sound effects: Let’s just say the gingerbread men should all have their heads bitten off. My only complaint with the game probably has more to do with my inept fingers than the game’s design: I learned quickly that I need to be careful moving tiles on the bottom left of the screen, lest I accidentally start a new game. Egerter Software’s Rudolph’s Revenge is Simon—the old memory-testing game—with reindeer. Simply listen and watch the reindeer’s noses light up and repeat the light-and-sound pattern in the same order. I played it at the most difficult level—the app offers easy, medium, and hard levels of difficulty—and stumbled after 10 rounds or so. My son loves this game, which also has a “free play” feature that lets him improvise his own compositions on the reindeer’s noses. Good fun. 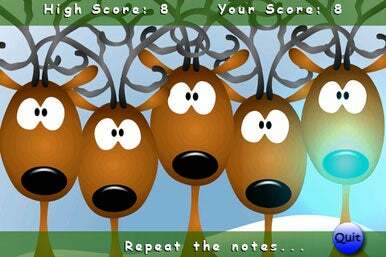 Following the Blinking Nose: Play the memory-testing game Simon reindeer-style with Rudolph’s Revenge. I wish I could say the same for Pick Up and Play’s Santa’s Workshop, which is more frustrating than fun. The game has a lot of potential, featuring three scenarios challenging the player to help Santa and his elves finish producing the toys, load the sleigh, and make sure all the kids’ get their toys in time for Christmas morning. The trouble stems from the graphics, which are primitive, and the interface, which is frustrating. The icons are simply too small and too difficult to move around the screen. You tap on Santa and he may or may not move where you want him to go. My son stuck with it only slightly longer than I did. I hope that doesn’t put him on the Naughty List. Christmas Questions: You and up to three other players answer anywhere from 10 to 50 questions about the holidays in Christmas Trivia. Finally, a fun party game for adults and teens is Hot Potato’s Christmas Trivia: Are You Smarter Than Santa? The answer, in my case, is yes and no. I did not know, for example, that Christmas is called Bada Din in India or that the Portuguese enjoy an additional meal called consoada on Christmas morning. But now I do… and so do you! The app supports up to four players and lets users select anywhere from 10 to 50 questions of varying difficulty. To heighten the challenge, you can switch on the game’s timer, which forces you to answer in as little as five questions or lose the game. The timer can be a disconcerting distraction, adding to the pressure of the game. Christmas Trivia has a user-friendly interface and clean design, except for the unfortunate placement of the “next question” button at the bottom left side of the screen, so close to the fourth answer option. The slider controlling the number of questions in the game can be stubbornly sticky. And the game isn’t as stable as the other apps I reviewed. It crashed on me twice—perhaps in the belief it was saving me some embarrassment, based on my hasty answers. I would be remiss to not make note of a handful of Hanukkah-related applications. In addition to Andrew Grant’s Hanukkah Holiday List app, LilBros and RustyBrick sell Menorah lighting applications. I was slightly surprised not to find any Kwanzaa or Winter Solstice-themed apps for sale. Surely there is a lively druid niche for some enterprising developer to exploit. The applications are compatible with any iPhone or iPod touch running the iPhone 2.1 software update.